If you want RV safety & reliability for Dometic and Norcold refrigerators purchase the Fridge Defend by ARP Control. Thank you for choosing the ARP for keeping your fridge running safe and efficient. Each of the items we offer below has a reference number so it is easier to identify each product. Use the Product Details link to read the item overview and recommended applications for the particular ARP Control you may be interested in. For easy product selection, use the green Tab Menu 'Product Selection' below. Please provide us with the make and model of your fridge if you can. Use the "How did you find us?" to tell us if a friend, advertisement, RV repairman, or cooling unit manufacture told you about our product. Instructions: Subjects are listed on left. Click the link to the right to go directly to the subject matter on this page. The shipping below includes USPS Priority Mail for shipments within the USA. The standard shipping fee includes $50.00 of insurance and tracking. Because we cannot be responsible for shipping incidents, we recommend returning from the shopping cart with the "continue shopping" link and acquiring additional insurance from the USPS. How long does it take to get my ARP Control? USPS claims 3 day delivery for Priority Mail. Most orders go out the same day if order is received before 9:00am MST time. If we are on the road, orders may take up to 2 days to ship, thus any special shipping instructions shall be e-mailed to us. What can I expect after I order my ARP Control? Please be sure to give us accurate fridge Make & Model, Email (critical), and Shipping Address (critical), information when placing your order. We will only ship to the address given. After you place your order, PayPal will send a receipt to the email address given, use the email address that you will use for any correspondence with us, this email address identifies you as the original purchaser. When the shipping label is created through PayPal's services, a tracking number will be sent to the email address given, along with any information that pertains to the Make & Model of fridge that the ARP was purchased for. A link to the installation manuals will also be provided in this email. It is the responsibility of the end user to provide an active email address during the purchase, and to insure that the email account is setup for emails to be received from PayPal and ARPC LLC. Please use the Contact Us form if the above emails do not arrive within 24 hours of your purchase. The final cost once the order is placed includes shipping and handling. Make sure your shipping address and other details are correct, our point of sale merchant charges fees, and there are handling charges that will not be refunded if we need to issue a refund. See our return policy document for more information concerning returns and charges associated. We value our Canadian customers, by entering your shipping address our present rate of $35.00 USD will be charged for shipping and handling. A tracking number will be provided, one can use the tracking number for the USA from pickup until package reaches US Customs. After clearing US Customs, the same tracking number can be used with the Canadian Postal Service until delivery. 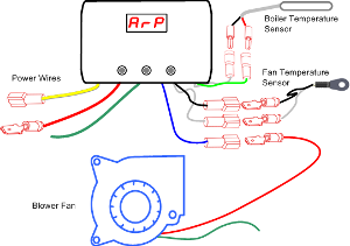 This kit works on all RV refrigerators, this kit has boiler protection and no fan-controller. NOTE: We recommend 2 internal Defroster Fans per fridge. This control does not control the defrost blowers, the defrost blowers will run full-time with this control. NOTE 1: We recommend 2 internal Defroster Fans per fridge, select the option preferred below. NOTE 2: This kit does not come with the external ventilator blowers, see KIT #3 or #4 below. NOTE: We recommend 2 internal Defroster Fans per fridge, select the option preferred below. If more than 2 defroster blowers are desired, please use the 'Continue Shopping' link when checking out to return to this page and purchase additional options, KIT #5b . A blower is different from a fan because a blower has a "squirrel cage" rather than a fan-blade. The blower is quieter, uses less amperage, and produces more pressure than a fan. Thus, blowers are better suited for improving the efficiency of your cooling unit for RV refrigerator applications. After selecting Add to Cart, select the quantity of blowers needed. Why do I want these special blowers only available through ARP Control? Ball bearing, 0.04 amp, Brushless, Lock Rotor & Auto Restart Function, 2 CFM. The circulation fans are small, they will not take up room in your fridge. Our fix fridge fans blow just the right amount of air, large computer fan blow more air than needed and cause efficiency issues that lead to excessive ware-&-tare on the cooling unit by cycling it too much. 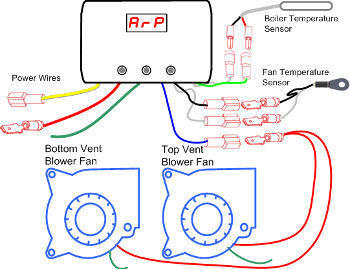 Our blower fans drawing only 0.04 amps each, run just when the fridge is producing refrigerant, thus do not run full time when connected to the Fridge Defend + Fan Controller, all this making our system easy on your 12 volt power, no need to be on the grid! The fans help defrost the fridge and keep a uniform temperature within the fridge so lettuce does not freeze on the bottom while milk spoils on top of the fridge (may need fan in bottom of fridge to prevent freezing) . Superior to other airator or fix fridge type systems, by running a fan in the fridge full-time it causes the fridge to have to cycle too often, a fan should only run within the fridge when the fridge is producing refrigerant. One of our fans will circulate all the air in a 6 cubic foot fridge every 3 minutes, a Norcold 1200 with two of our blower fans will circulate all the air in the fridge every 3 minutes. Want to fix your fridge or have the most powerful diagnostics tool available to troubleshoot your Dometic or Norcold? Ordering of separate data collection cable required. Please consider returning from cart "Continue Shopping" and adding the #9 Circuit Breaker for fridge and ARP protection. 1) After accepting the terms and conditions check box below press the "Buy Now" button. a) On the next page you will be given the ability to Enter the "Price per item", put in the TOTAL pre-arranged price for ALL of the items here. Leave the "Quantity" set to the number 1, then press continue. b) On the next page you can either pay with your CREDIT CARD or use a PayPal account. $15.00 shipping is automatically added for a single purchase. For multiple controls, contact us for the prearranged shipping fee. c) All purchases on this page shall be followed up with an email or use the Contact Us form to give us the type of control, quantity, and any items such as Circuit Breakers or Fans ordered. Due to the popularity of our control combined with our work load, we have introduced a standard service charge for product diagnostics. We build what we feel to be the highest quality RV type controller on the market, but not everything is perfect, thus we will take care of you. If a control is sent back to us, and no problems are found with the controller, clearly the issue is with other systems on your RV. 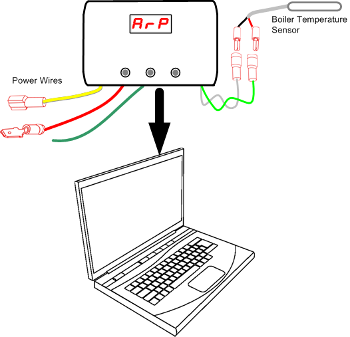 Thus, we are providing value by charging for diagnostics checks of the Fridge Defend by ARP. 1) Ship your control to us only after using our Contact Us form to get shipping authorization and instructions. Turn around time will be ASAP, but is dependent on our present work load. 2) Please include with your control the return shipping address and a note requesting service so our receiving department knows how to process your control. 3) Once we receive your controller and understand what your issues are, we will diagnose the controller and report back to the phone number provided. If your control is found to have defects in materials or workmanship there will be no charge. If no issues are found, or there is a non-warranty defect we will inform you of any charges before proceeding and/or returning the control to you. The amount paid includes return shipping within USA. Canadian shipping not included, please use Contact Us form for present rates. Our standard shipping fee of $12.50 does not cover the cost of parts sold. We recommend that one purchases the added insurance at the time of purchase for $4.60 which covers up to $300.00 worth of loss. This helps guarantee that if a shipping incident occurs, such as loss of merchandise during shipping, the customer does not suffer financial loss. We want our customers to know that we take great care to package our product. But, once we deliver the package to the USPS, we no longer are responsible for how the machines, employees, and contractors at USPS handle the package. We recommend purchasing USPS Signature Confirmation due to a recent trend in parcel theft. Bad people are taking packages once delivered. Neither ARPC LLC nor USPS will insure or refund your purchase price if the parcel is lost after delivery even if you purchased shipping insurance. If you cannot find what you need please use the Contact Us form from the top or bottom menus.